Jesus: more than a baby! It’s that time of year, when even non-christians think about Jesus, at least a little. But what do they think? 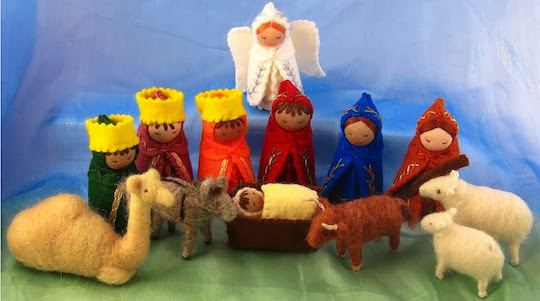 We can all feel good about the stories of the baby Jesus – a young, poor pregnant woman seeking refuge from the cold winter, giving birth to a very special baby that few people recognised at the time. It doesn’t matter whether the star, the wise men, the shepherds and the angels were real or not, it is a good story. But what about the rest of his life? What is the historical reality behind that? There are probably more books written about Jesus than any other character in history. Some modern day sceptics argue that Jesus never existed and the stories about him are legends, possibly inspired by pagan myths. But secular historians, of whatever belief, or none, almost unanimously reject such fanciful hypotheses. Using the same methods as they would use to investigate other ancient figures, and without treating the Bible differently to other ancient writings, historians have come to a consensus about many aspects of Jesus’ life. We have so many copies of the gospels we can be confident they are very good copies of the originals. Jesus was indeed a historical figure and we can know a significant amount about his life and teachings. There is little in the gospels of Matthew, Mark and Luke that is legendary – i.e. not much was invented later, after the original eye witnesses had died, although they do contain the first christians’ beliefs about Jesus as well as the bare facts. Miracles: Jesus was known as a healer, but what is the truth about these miracles? Resurrection: Jesus followers had visions of him after he died, but was he really resurrected? Divinity: Jesus said and did many things that imply he claimed to be divine, and not long after he died his followers were worshiping him alongside God. But did he really think he was “equal with God? And should we believe he was telling the truth? That is the data on which our personal belief choices can be made. How do we answer these questions? Was Jesus a fraud, who deliberately misled people about his mission from God? Was he delusional, i.e. suffering from a mental illness? Was he simply mistaken? Can a person be ‘simply’ mistaken, or does this imply mental illness? Was he telling the truth? Deciding honestly which is the most probable hypothesis is the challenge behind Christmas. I have outlined these options in a little more detail in Jesus – image of God?, for those who wish to accept that challenge. To all readers, regardless, thank you for visiting my blog this year, and merry Christmas to you! Complimentary or critical comments are equally welcome, as long as they promote friendly conversation, but unacceptable comments will be deleted. To see what I regard as unacceptable, or to get help in formatting comments, please read my comment policy. You can change your comment for 5 minutes after posting. Get email notification of new posts. This function was playing up. If it doesn't work for you, please send me an email and I'll subscribe you manually. Get updates every post via a RSS Feed. Don't understand feeds? Check here.